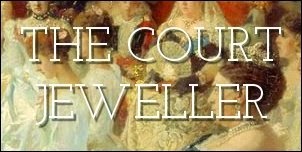 The Countess of Wessex was again the picture of elegance in pearl and diamond earrings and the Queen Mother's diamond clip brooch. The Princess Royal wore pearl earrings and her necklace made of three strands of small pearls. Anne's daughter-in-law, Autumn Phillips, wore a pair of classic, petite pearl and diamond stud earrings. Princess Alexandra wore an explosion of color, wisely pairing her bright coat and hat with pearl and diamond jewels: cluster earrings, the choker with a geometric clasp, and her six-petaled flower brooch. Princess Michael was still rocking the eye patch on day two, pairing it with oversized jewels in a pale shade of greenish-blue. Her carriage wave also revealed a glimpse of a bracelet with an evil eye charm.